It might be the only one. At least, there’s no one owner/founder Brad Baker knows of putting virtual pinball and video games into cabinets, which make them look like real arcade machines, on the scale VPcabs is. But that could change after May 13, when an episode of “Shark Tank” featuring the company airs at 9 p.m. on WCPO 9 On Your Side. Baker said he plans to watch along with about 300 other guests at a viewing party at his church, Imago Dei Christian Fellowship in West Chester. He hasn’t seen the episode yet, and he was so busy answering questions from the panel of five judges at last fall’s taping that he can’t say how well he did. “It was overwhelming” defending his business before people he respected and feared, he said. But he’s expecting that no matter how he did, the exposure will lead to sales, more so than the Facebook advertising and marketing at arcade game trade shows that he now does. The show’s producers have asked him not to say whether any of the judges decided to invest in his company, or to reveal certain information such as its annual revenue. So far, he has bootstrapped the company with his own savings from other businesses he has owned, such as installing home theaters. The 40-year-old Fairfield native has worked for himself most of his life. About three years ago, his brother, Jesse Baker, who owns Arcade Legacy inside Forest Fair Mall in Forest Park, told him he had seen something cool online – virtual games being put into old pinball machine cabinets. They put together their own model and set it up inside Jesse’s arcade. “Within a few weeks, eight people were asking me to make a machine for them,” Brad said. He decided he had found a market for a new business. Initially, he made the machines in his garage, and later moved to rented space in Forest Fair Mall. Asked to leave because the manufacturing process was too noisy, he moved to 6,000 square feet in a Fairfield industrial park, where he now has seven full- or part-time employees. The company makes four of them, the most expensive and hottest-selling being The Wizard at $7,995. It looks and plays like a real pinball machine – it shakes when the ball hits a bumper, it says “tilt” when you use too much English, it makes a loud knock when you earn a replay. 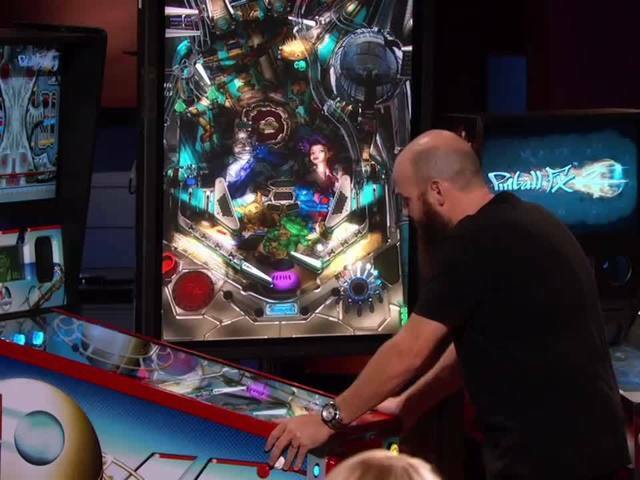 But there’s no actual pinball, just a high-end Windows gaming program with visuals -– the effects all come from the tactile feedback system in the software. As is true of all the machines, with the touch of a button, players can choose a variety of classic pinball games to play, all of them displayed using high-definition graphics. The Classic has the same body design as The Wizard, but it lacks the tactile feedback system and it costs $5,495. Designed for those who don’t have much space, the Mini is two-thirds the size of The Classic, and it sells for $3,995. The newest and cheapest machine, The Vertigo, retails for $3,495. It’s tall and thin like a video arcade game, better for playing classics such as Asteroids. And like all the machines, with its built-in Wi-Fi, users can download any number of classic games available on the Internet, in addition to the ones VPcabs has already. Most of the company’s orders come from the website, where customers can choose features such as the color of the graphics and the trim molding. Machines are shipped to customers all over the country and to some overseas, Brad said. The machines have slots for coins, but they’re all fake. Long-term, however, Brad’s plan is to sell the machines to owners of arcades, restaurants and bars where customers could use coins to play.